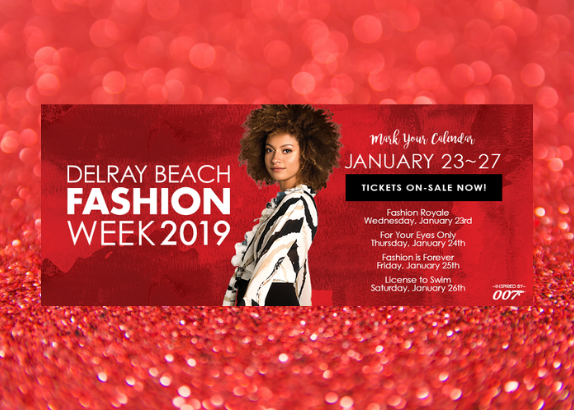 Delray Beach, FL (January 2, 2019)…Downtown comes alive with style from January 23-27 during the 6th annual Delray Beach Fashion Week. The 2019 theme of “Fashion Never Dies” inspired by 007 will be woven throughout the event featuring spectacular fashion, local designers, entertainment and beauty. Diverse fashions will take center stage at the runway shows, fashion luncheon, Shop the Runway In-Store Shopping Event and in-store promotions throughout Downtown Delray Beach. A Blast from the Past, Antica Sartoria, Aqua Swimwear, Beverly Hills Boutique, Biba, Blings & Things, C.Orrico, Charleston Shoe Co., Chico’s, Coco & Co., DeBilzan Gallery, Elektrik Boutique, Fresh Produce, Glavidia: by Glavidia Alexis, Greenlines, Haystacks, House of Zen Dali, Hy Pa – Hy Ma, Jennifer on the Avenue, LF Delray Beach, Morley, Nina Raynor, Patchington, Periwinkle, Quiet Storm Surf Shop, Ramona La Rue, Sara Campbell, SPICE, Sunday State Style, Surf District Surf Shop, The House of Perna and Neon Bohemian, Tommy Bahama, Tootsie’s, Unique Boutique, Vince Canning Shoes, Vixity Jewelers, Who’s Karen Boutique. Achievement Centers for Children & Families’ (ACCF) mission is to ensure school readiness, provide skill building opportunities, promote academic achievement and support healthy lifestyles. Affordable, nationally accredited programs allow families to work, increasing their overall stability.